As the most developed political organisation beyond the state, the EU has　been regarded by many political theorists as indicative of a major shift towards post- and supranational forms of global governance, as well as offering a model for how such new political forms might be organised. However, as a growing number of political theorists have engaged more closely with the specifics of European integration and the operations of its institutions, these idealisations have largely fallen away. The process of European integration has been less straightforward and far more contested than has been often assumed, while the peculiar nature of the European political community and the uniquely complex organisation of its institutions have presented intriguing challenges to the core categories with which political theory operates. These concepts, which have been developed over the last centuries with the nation-state in mind as the primary example of modern political organization, cannot be applied wholesale to the EU. Concepts such as legitimacy, sovereignty, democracy, identity, citizenship, constitutionalism, representation, solidarity, etc. must be reassessed if they are to be useful for understanding and normatively scrutinising this political entity. 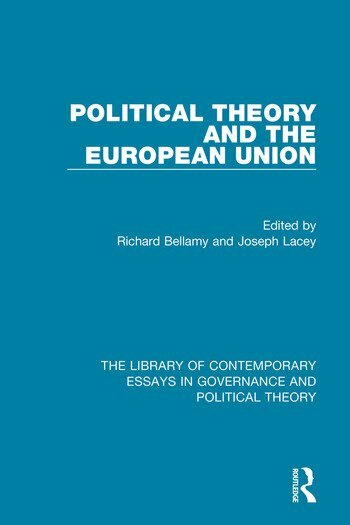 This volume brings together some of the most important scholarly contributions over the last decades that have sought to contribute towards developing a political theory of the EU as an idiosyncratic political organisation. These contributions raise issues not only about the feasibility of attempts to construct political forms beyond the nation state, but also the extent to which they may be desirable. A mixed picture emerges from the state of the art: one that emphasises the existence and importance of continuities with the past in the development of international institutions on the one hand, and conceptual and practical innovations that point towards the need to break with the familiar on the other. 1. Erik Oddvar Eriksen and John Erik Fossum, ‘Europe in Search of Legitimacy: Strategies of Legitimation Assessed’, International Political Science Review 25, 4, 2004, 435-459. 2. Richard Bellamy and Dario Castiglione, `Legitimising the Euro-"Polity" and its "Regime": The Normative Turn in EU Studies’, European Journal of Political Theory 2, 1, 2003, 7-34. 3. Daniel J. Elazar, ‘The New Europe: A Federal State or a Confederation of States?’, Swiss Political Science Review 4, 4, 1998, 119-139. 4. Olivier Costa and Paul Magnette, ‘The EU as a Consociation: A Methodologial Assessment’, West European Politics 26, 3, 2003, 1-18. 5. Nicole Bolleyer and Christine Reh,　‘EU Legitimacy Revisited: The Normative Foundations of a Multilevel Polity’, Journal of European Public Policy 19, 4, 2012, 472-490. 6. Kalypso Nicolaïdis, ‘We, the Peoples of Europe…’, Foreign Affairs 83, 6, 2004, 97-110. 7. Jürgen Habermas, ‘Why Europe Needs a Constitution’, New Left Review 11, 2001, 5-26. 8. Pavlos Eleftheriadis, ‘The Idea of a European Constitution’, Oxford Journal of Legal Studies 27, 1, 2007, 1-21. 9. Dieter Grimm, ‘The Democratic Costs of Constitutionalisation: The European Case’, European Law Journal 21, 4, 2015, 460–473. 10. Sergio Fabbrini, ‘The Constitutional Conundrum of the European Union’, Journal of European Public Policy　23, 1, 2016, 84-100. 11. Giandomenico Majone, ‘Europe’s "Democratic Deficit": The Question of Standards’, European Law Journal 4, 1, 1998, 5-28. 12. Andrew Moravcsik, ‘The Myth of Europe’s Democratic Deficit’, Intereconomics November/December 2008, 331-340. 13. Andreas Follesdal and Simon Hix, ‘Why There is a Democratic Deficit in the EU: A Response to Majone and Moravcsik’, Journal of Common Market Studies 44, 3, 2006, 533-562. 14. Fritz W. Scharpf, ‘Legitimacy in the Multilevel European Polity’, European Political Science Review 1, 2, 2009, 173-204. 15. Sandra　Kröger　and Richard Bellamy, ‘Beyond a Constraining Dissensus: The Role of National Parliaments in Domesticating and Normalising the Politicization of European Integration’,　Comparative European Politics 14, 2016, 131-153. 16. Erik Odvar Eriksen, ‘An Emerging European Public Sphere’, European Journal of Social Theory 8, 3, 2005, 341-363. 17. Klaus Eder, ‘A Theory of Collective Identity: Making Sense of the Debate on a European Identity’, European Journal of Social Theory 12, 4, 2009, 427-447. 18. Joseph Lacey, ‘Must Europe be Swiss? On the Idea of a Voting Space and the Possibility of a Multilingual Demos’, British Journal of Political Science 44, 1, 2014, 61-82. 19. Beate Kohler-Koch, ‘Civil Society and EU Democracy: "Astroturf" Representation?’, Journal of European Public Policy 17, 1, 2011, 100-116. 20. Chris Shore, `Whither European Citizenship? Eros and Civilisation Revisited’, European Journal of Social Theory 7, 1, 2004, 27-44. 21. Rainer Baubock, ‘Why European Citizenship? Normative Approaches to Supranational Union’, Theoretical Inquiries in Law 8, 2, 2007, 452‐488. 22. Yasemin Nuhoglu Soysal, ‘Citizenship, Immigration, and the European Social Project: Rights and Obligations of Individuality', British Journal of Sociology 63, 1, 2012, 1-21. 23. Andrea Sangiovanni, ‘Solidarity in the European Union’, Oxford Journal of Legal Studies 33, 2, 2013, 213-241.